Well, it's August already, I can't believe it! That means I have only a few weeks left, and with the holidays and everything, only two teaching weeks! It's going to go by so quickly. We're gearing up to welcome our new teacher, Megan, who will be joining us mid-this month for training and shenanigans! It's times like these when i reflect on how blessed I have been to have come back here to this wonderful school and this charming town again. I was a little nervous coming back because I had so many happy memories of this place, I was worried that coming again I wouldn't possibly be able to have a better time. But I have! Instead of the thrills and excitement of discovering Kurashiki and Japan for the first time, this time I felt like I was coming home and everything was warm and familiar. Like they say, there's no place like home and the feeling of homecoming just can't be beat. During the Obon holidays, I don't think I'll be doing anything too exciting. Just kicking back and relaxing, barbequing, watching fireworks and maybe if I can, doing a little bit of Hachijuhakkasho (the Shikoku 88 Temple Tour). Knowing this is the last stretch for me to save a bit of money for school before it starts has got me in a bit of a panic to keep a tighter hold on my wallet. 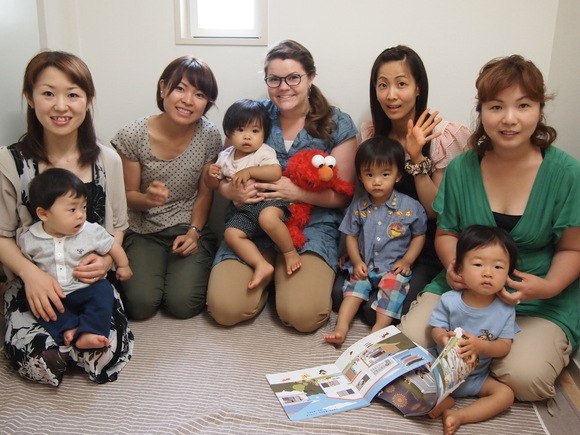 In any case, these next couple weeks I'll be looking more wistfully at all my students and at everything around me in lovely Kurashiki and taking lots of group pictures. 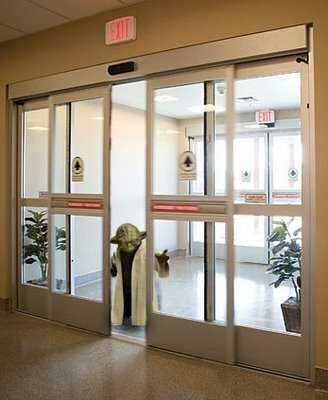 I'm afraid that I don't have much to report this week, other than a rather funny encounter with an automatic door. I was on my way into the supermarket, approaching the entrance and looking down at my cellphone, assuming the automatic door would do it's job and automatically open, when to my surprise I simply crashed into the door! What the...!? "遅っ！” I exclaim as I pick up the broken pieces of my cell phone, which had fallen apart on impact. As I pick up the battery, the door slides open. This brings me to my topic, or rather my rant, for the week. What's the deal with automatic doors that don't open until I'm standing right in front of the door with my nose pressed against it!? Last week, my co-workers and I were out at an Indian restaurant and in walks a group of young women all sporting big fluffy scrunchies in their hair. "Ewwww, scrunchies!" I said through a mouthful of nan. "What? Why?" asked my co-workers "Scrunchies are cute!" I gaffawed at them and gulped down my nan. 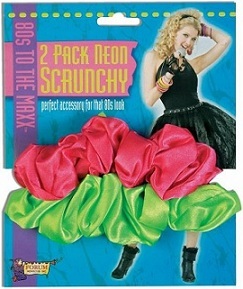 "Scrunchies," I began "are an unforgiveable 80s fashion faux pas. They are ancient relics, like kaboodles and gem-studded jean jackets, and can only be found hidden away in bathroom drawers to be used to tie back your hair for nighttime face washing, but never to be worn in public" I nodded impressively. "Wearing a scrunchie would invite a hail of ridicule from both friends and family, just like a matching denim jacket and jeans set would." "Well, they're popular in Japan. Guys love girls with scrunchies. There's an AKB48 song that's dedicated to scrunchy ponytails you know" explained my co-workers. I didn't believe them but later watched the video for myself. Wow! Maybe I'll dust off my old Elementary school scrunchie and try it out...Now where's that old kaboodle? On another note, the Hello Elementary kids are doing really well so far with their recital speeches! We decided this year to have each level do the same speech instead of individual speeches. This way it's easier to practice pronunciation and intonation and the kids can compete against each other, which they love to do. I chose three of the most well-loved children's books for the students to recite, each having a great story and varying levels of difficulty. If You Give a Mouse a Cookie, Where the Wild Things Are and The Giving Tree. The younger Pre-Elementary students will recite the beloved Louis Armstrong classic What a Wonderful World as a poem. The kids will also have a chance to animate their speeches, which will make each performance uniquely their own and will engage the audience more, especially those that don't speech English. We're really looking forward to it! 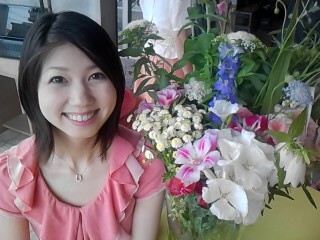 Miho has been coming to Hello twice a week for over a year to work on her English and improve her chances of landing an ultra-competitive flight attendant position. Each time she reached the final interview stage for some company we held our breath, crossed our fingers and felt the excitement with her. Each time she was denied we felt the disappointment with her. But we were all inspired by her determination and spirit, because she just kept trying harder. In other news, I went to Hiroshima yesterday for a festival with Akiko and some friends. We all wore yukata robes and geta shoes, ate taiyaki (sweet fish-shaped bean-filled pastry), visited some local restaurants and even checked out a haunted house! In America, haunted houses usually have skeletons, spider webs, vampires, ghosts and severed limbs but the Japanese one has strange traditional o-bake(monsters) like Ittan-momen, Rokuro-kubi and Oni. It was for kids, but I’ll admit I might have screamed in earnest once or twice. 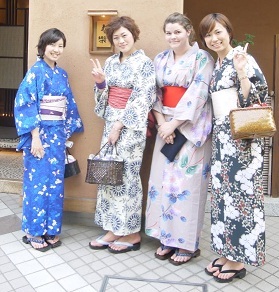 Festivals and yukatas make it official everyone, it’s SUMMER!! Hooray!